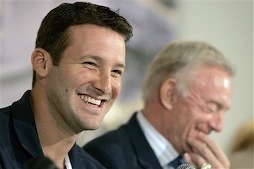 Tony Romo in happier times and on Doomsday against the Giants. The impossible nightmare came true Sunday. And as the color drained from Jerry Jones' face, three-time Super Bowl champ Troy Aikman underscored his former boss's dashed dreams at the hands of the New York Giants. "I know Jerry Jones and the rest of this organization is (sic) absolutely sick," Aikman said just before Fox fittingly began displaying its quick post-game countdown clock to the premiere of the network's new Terminator spinoff. It afforded former Cowboys coach Jimmy Johnson just enough time to twist the knife a bit. Noting that Jones earlier had given each player two extra free passes to the NFC championship game, JJ cracked, "Maybe the Cowboys will go to Green Bay now (as spectators), 'cause they've got tickets to the game." The first caller to "The Ticket's" post-game radio rehash began with, "What an embarrassment." The Dallas-based station's post mortem fittingly was sponsored in part by Jim Beam whiskey, although some pre-taped commercials were already a hangover. "Want a ticket to the NFC championship if the Cowboys win today?" listeners were asked. Late night D-FW newscasts and sports specials were all over the Cowboys, of course, with Fox4 reporter James Rose the first to say, "I felt like I was at a funeral" as grieving fans filed out of Texas Stadium. "It feels like somebody just died, dude," said a fan on NBC5. Fox4 was hit especially hard. Next Sunday's aborted NFC Championship game at Texas Stadium would have been another ratings blockbuster for the station. And the Fox network has the Super Bowl, too, which airs on Feb. 3rd during the early days of that month's annual ratings "sweeps" period. Sports anchor Mike Doocy remained at Texas Stadium Sunday night with ESPN and former Dallas Morning News reporter Matt Mosley. "The Deuce" had a handy "Choke City" chart ready for Fox4 viewers. It detailed the recent early post-season collapses of the Cowboys, Mavericks and Stars, plus the continued futility of the Texas Rangers. "I think the Cowboys is the biggest choke of all," Mosley obliged. Doocy also was moved to sarcasm after playing the night's featured post-game footage of a sobbing Terrell Owens. By now probably everyone's seen the Cowboys' theatrical wide receiver defending QB Tony Romo and his extensively publicized jaunt to Mexico with Jessica Simpson. "You guys can point the finger at him and talk about the vacation," Owens said before choking up. "And if you do that, it's really unfair. It's my teammate. It's my quarterback." Over on NBC5, sports anchor Newy Scruggs outdid Doocy by terming the Cowboys' loss "a big-time choke job." "NewDawg's" weeknightly sports segment is sliced in half by an elongated commercial break and treated as barely an afterthought by his station. But his Sunday night "Out of Bounds" show gives him an expanded forum to blast away, with able help from football season partner Drew Pearson. "Oh, this loss is shameful, Drew. Shameful," Scruggs began. Pearson, recipient of the famed "Hail Mary" pass from Roger Staubach in the 1975 Division Playoff game against the Vikings, said the Cowboys lacked "mental toughness" and "took too much time off (during the bye week). They weren't focused." Scruggs also ripped receiver Patrick Crayton for dropping a key first down pass -- "He was terrible tonight" -- and faulted himself for buying into (coach) "Wade Phillips' 13-and-3 sunshine." CBS11 sports anchor Babe Laufenberg, who also does the Cowboys' radio-casts with Brad Sham, took a comparatively genteel approach. Romo's trip to Mexico is a "non-issue" to him, Laufenberg said, "but it doesn't mean I'm gonna change the minds of the fans out there." Loquacious sidekick Steve Dennis earlier reported that "many will only think of a beach in Mexico" and a quarterback who now has lost his only two playoff games. Or, if you please, "It's just like the Mavericks now," Dennis later added. "Nothing is going to matter again until they win a playoff game." That leaves Belo8's usually rowdy Dale Hansen, who emptied an arsenal of heavy weapons fire at former Cowboys coach Bill Parcells during his four-year tenure. On Sunday night, though, Hansen was notably meek and forgiving. "Next year looks pretty good," he said at the top of the 10 p.m. newscast before returning in tandem with ex-Cowboys assistant coach and longtime friend Joe Avezzano for their weekly Sunday replay. Avezzano had the tartest comment, scolding Crayton for refusing to face the media after the game when he had trash-talked the Giants during the week before it. But Avezzano also commiserated with his old team, telling Hansen, "Nobody feels as bad a those coaches and players do tonight." Hansen and Avezzano both disagreed with Phillips' decision to change the starting offensive lineup (running back Julius Jones was benched in favor of Marion Barber). Finishing the regular season on a downswing also might have contributed to the loss, Hansen said. But it was a team loss, Hansen said, and "you'll never convince me a trip to Mexico had anything to do with it." ADDENDUM -- Faithful readers of unclebarky.com know that its proprietor is a Wisconsin-born true believer in the Green Bay Packers, who now will get to face the Giants at frigid Lambeau Field rather than the Cowboys at Texas Stadium, where QB Brett Favre has never won. Still, there's sympathy for Romo, and precedent, too. During the Vince Lombardi-led Packer glory years, running back Paul Horning occasionally tested the flinty coach's patience as the NFL's resident "Golden Boy." Wing man Max McGee could be a handful, too. 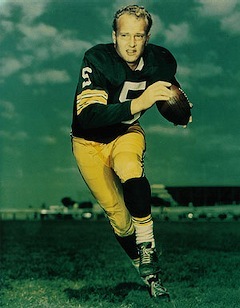 Hornung's 1965 "candid autobiography," Football and the Single Man, is still among the many Packer artifacts gracing space at unclebarky.com central. It includes a chapter titled "The Subject Is Women," in which Hornung talks about his many-splendored off-field exploits. He names just one of his "Black Book" entries, though, "a little model, Pat Mowry, who had been Miss New Hampshire." 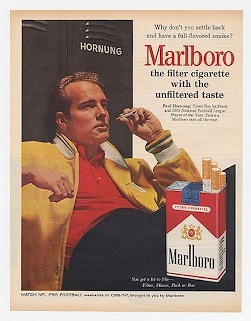 Imagine how Hornung would be hounded today. He'd be on TMZ.com incessantly, let alone thousands of other gossip-mongering web sites. Envision the feeding frenzy over this passage in his book: "I remember one girl in Hollywood, who was so beautiful. Her figure was out of this world, a Miss Somebody or other from somewhere. And after a while I found she had no sense at all. After two or three dates talking with her, if you asked her who Khrushchev was, she'd be stuck for an answer." Hmm, that sure sounds like somebody that Romo and the rest of the country know all too well. Hornung also wrote, more than a little condescendingly, "You can get very bored with a dumb beauty . . . I'd rather maybe go out with an ugly girl and have a lot of laughs." One thing seems certain. Jessica Simpson's true affection for Romo will be put to the test now that he's a two-time playoff loser without all that Jedi Warrior aura anymore. Svengali Daddy Joe Simpson, who also manages his daughters' careers, doesn't much like either of them dating guys whose cachet has started to go thataway. It's just not good for business.